Arrive at Yangon International airport, meet the native English speaking guide. Transfer to hotel for check in. Lunch break. Start sightseeing of Yangon city center, Sule Pagoda, City Hall, High court, Independence monument, where you can see the bustling life of the city. 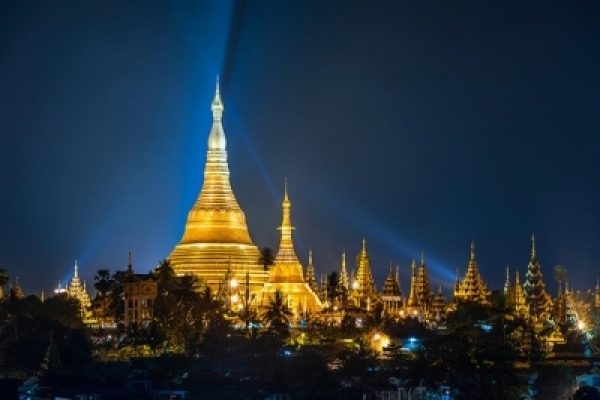 Then proceed to the well-known Bogyoke (Scott) market- the most famous market of Yangon and visit the most spectacular religious edifice,Shwedagon Pagoda for daybreak sunset. Overnight in Yangon. Remarks: Bogyoke (Scott) market,National Museum are closed on every Monday and Government holidays. After morning breakfast, transfer to airport for Bagan domestic flight. Start visiting Nyaung Oo market – which is full of local products,Proceed to Shwe Zi Gon Pagoda – built by the founder of Myanmar Bagan dynasty king Anawrahta in 11th century, Ananda Temple–an accredited Mon ethnic brick architecture and most beautiful temple in Bagan, Manuha Temple-Constructed by a Mon King,That Byin Nyu Temple – an attractive brick mason architecture in South- East Asia,Gaw Daw Palin Temple – The finest brick structure built in Bagan and visit the famous lacquer ware industry and their process works.Dinner will be provided at Nanda restaurant with Puppet show. Overnight in Bagan. 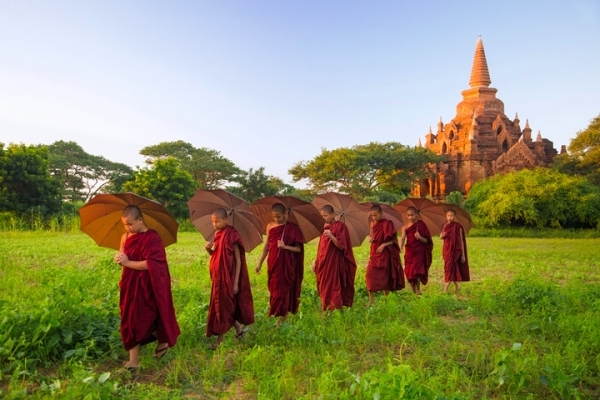 Take a day return trip to Salay town which was established during Bagan period. 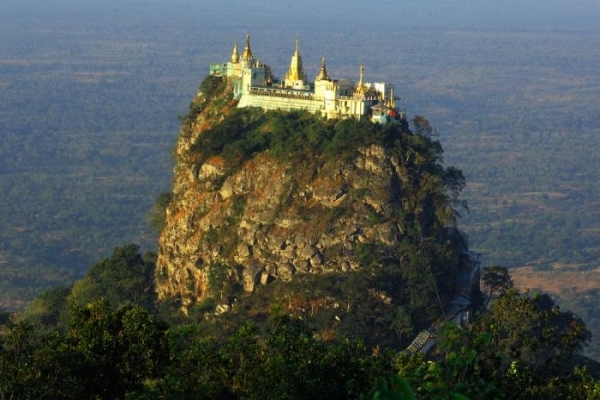 Visit the famous Yoke Sone ancient teak monastery, local market – where you can explore the native product and continue to Mount Popa- an extinct volcano shrines dedicated to spirits known as Nats. For the energetic, climb 777 steps up to the shrine top to share the view of Mt. Popa environ. Return to Bagan for daybreak. Overnight in Bagan. After morning breakfast, transfer to airport for Mandalay flight. Check in hotel. Start Amarapura famous sightseeing of Maha Gan Da Yone Monastery – Where you can see nearly a hundred of monk while they are having their 2nd or last meal of the day and observing the Buddha teaching. Proceed to 1.2 Km long U Beinteak bridge- which was recuperated from the waste of abandoned Ava palace, Wood carving, Marble carving and Bronze casting.Lunch break. Return to visit Mandalay Maha Myat Muni Buddha Image – A spectacular Buddha image of Rakine feathur, Gold-leaf processing method, Shwe Nan Daw Kyaung(Golden Palace Monastery)- a traditional teak architect handicraft design,Kutho Daw Pagoda- known as the world’ s biggest book (Buddhist scripture), consisting of 729 marble slabs,Tapestries and silk weaving of Mandalay. Sunset would be spent at Mandalay hill for day break. Overnight in Mandalay. 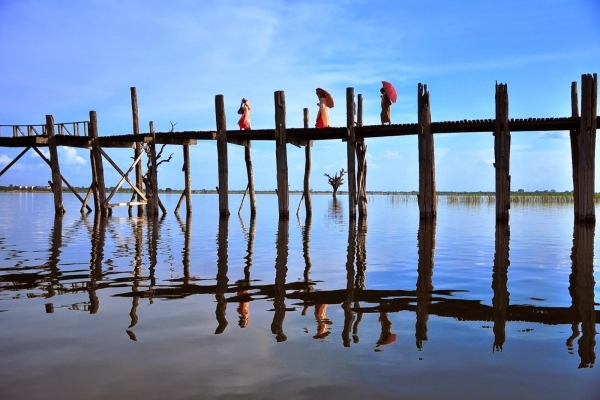 Transfer to Mandalay jetty for a boat ride on the Ayayarwaddy River to Mingun village about 11 km (1hour) upstream from Mandalay. 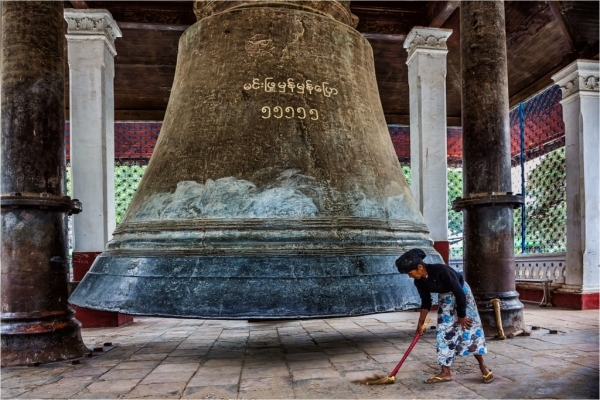 Visitthe Pathodawgyi- One of the world’s largest unfinished brick monument built by King Bodaw Phaya, Mingun Bell – weighing 90 tons the biggest Bronze bell in Myanmar and Mya Thein Dan Zedi (Stupa) with bullock cart. Transfer to airport for Yangon flight. Overnight in Yangon.